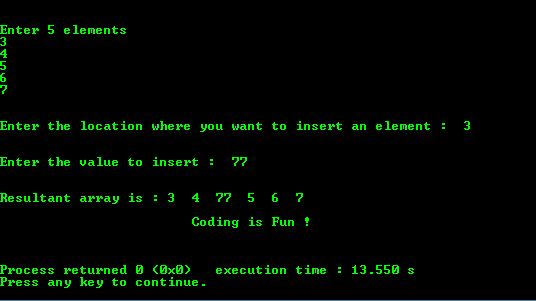 Below is a simple program to insert an element in an array. In the above program we take an array as user input and then ask the user for a new number that they wish to add to the original array, and the position where they want to add the new number. The we shift the existing numbers from the index position to the end of the array one position to the right, therby vacating a space for the new element. And then we add the new number at the user specified position index.